On an implementation I’m involved in right now we’re using ACE project as an issue tracker. On most implementations I’ve been on before issues, bugs and problems that weren’t tracked or recorded on the official Project Plan were monitored via a spreadsheet. ACE has enabled us to effectively monitor issues and updates, prioritise them and track their progress via e-mail notifications and various statistics the tool generates. I highly recommend it. AceProject is the next generation of high-level project management software solutions for today’s corporations. Improve your organization’s productivity. Get projects done more quickly and intelligently. From collaboration software to an online planning tool, AceProject lets you manage all kinds of projects within your organization. Use AceProject to plan all stages of software development, implement construction and engineering projects, revamp your web site…your ideas are as good as ours! AceProject’s useful timesheet module, project calendar and email notification keep both your employees and project managers informed. Moreover, with its Gantt chart, numerous reports and comprehensive statistics, AceProject gives you the big picture on project advancement. I’m interested to know what other issue tracking tools and software people may be using. I came across an interesting discussion on the ITtoolbox forums the other day which contained some useful tips on negotiating SAP implementation contracts as well as general implementation advice. Despite the discussion being SAP orientated the advice given could quite easily apply to an Oracle eBS implementation or any other ERP deployment. Make sure that you work with SAP and their current methodology, what ever that is. Make sure you call out every deliverable for each phase. Make sure that you include DATES that each deliverable is due. Make sure that you specify what you are responsible for and what the consultancy is responsible for, for EACH deliverable. The consultancy is required to deliver a fully configured, PRODUCTION system, not a "prototype!" Specify that you have a customer acceptance clause. Make sure that you develop a matrix that ties each requirement to a test for each requirement. Make sure that you include a "Not to exceed" clause where you figure what the maximum is and they agree to it. It’s essentially a fixed price contract; but forces consultancy’s to bill you by hour. Always make sure that you include in the contract that the consultant PM must report hours weekly. That way you make sure that you aren’t getting "double Billed" by some rookie at the consultancy’s back office. Make sure that the consultants are on site at least Tu-W-Th. It may cost a little more but with all the local talent that exists, the travel expenses will be minimal compared to a botched implementation. Make sure that the implementation team is given sufficient time to "play" with SAP and learn the ropes. Co-locate them into a separate office section so they can make real time decisions. Bring in out-of-town key team members. Relieve them from all but the most critical job functions. Make sure that your team is "empowered" to make change happen, and BTW, implementing is ALL About CHANGE MANAGEMENT and COMMUNICATION. One last word of wisdom. I have found that thing will be a lot easier for your company if you reengineer your processes to match SAP processes whenever possible. Use the "default" process for 6 months and then if you must modify them I had to offer that even though as a consultant, not ONE of my clients ever heeded that pearl. And when I went back after 6 months or so, almost everyone wished they had followed that one piece of advice. 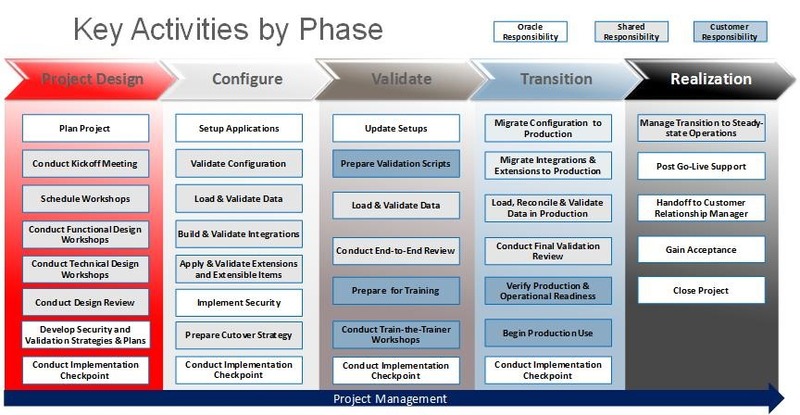 Having been involved in IT and ERP implementations for the past 9 years I can certainly agree with all of the points on Bob’s checklist and hope that posting them here will provide useful advice and ideas to readers currently implementing or planning to deploy enterprise software solutions. This post explains the Prince 2 Project Management Methodology and points you to where you can download related templates and documentation. PRINCE, which stands for Projects in Controlled Environments, is a project management method covering the organisation, management and control of projects. PRINCE was first developed by the Central Computer and Telecommunications Agency (CCTA) now part of the Office of Government Commerce (OGC) in 1989 as a UK Government standard for IT project management. Since its introduction, PRINCE has become widely used in both the public and private sectors and is now the UK’s de facto standard for project management. 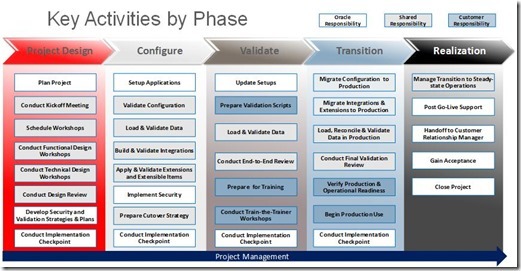 Although PRINCE was originally developed for the needs of IT projects, the method has also been used on many non-IT projects. The latest version of the method, PRINCE2, is designed to incorporate the requirements of existing users and to enhance the method towards a generic, best practice approach for the management of all types of projects. This methodology seems to be fairly popular in the UK and I’m seriously thinking of becoming a Prince 2 practitioner if I get the chance to get sent on some training. You can also download some useful case studies and templates from the official site (personally I think the Oracle AIM ones are much better) as well as this other Prince 2 site (for this site, you will have to perform free registration before you can download).